During the hot Summer months, I avoid heating up my kitchen with the oven. I prefer to make no-bake pie crusts, by using alternative ingredients. You don't need to use a rolling pin, dough board, pastry blender or any of the traditional pie baking equipment. All you basically need are the ingredients, a large bowl, a measuring cup and of course, your pie pan. 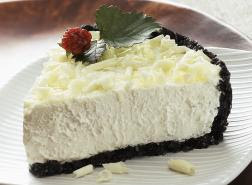 These recipes are easy to make and best suited for refrigerated or frozen dessert-style pies. You will want to chill your pie crust for 1 hour (or until firm), before filling the pie shell with your pie filling. Here are 5 of my favorite recipes. Combine crushed cookie crumbs with melted butter until well mixed. Press mixture firmly into place into a 9" around pie pan. Combine crushed cornflakes with sugar and butter, until well mixed. Spread the crumb mixture evenly and firmly into a 9" round pie pan. Combine crushed wafers with butter, until well mixed. Spread the crumb mixture evenly and firmly into a 9" round pie pan. Combine crushed graham crackers with sugar and butter. Toss thoroughly to combine. Press mixture firmly into a 9" round pie pan. Combine crushed pretzels with sugar and melted butter. Toss to thoroughly to combine. Press mixture firmly into a 9" round pie plate. This article is copyright 2009 by Shelly Hill, all rights reserved. If you would like to reprint the article on your site, please contact me for original copy of article. Thanks!